Rio Grande do Sul is the southernmost state in Brazil and is about the size (and shape) of Poland. Its capital, Porto Alegre, is on the Rio Guaíba at the north end of Lagoa dos Patos, a huge inland bay about 200 km long and 60 km wide. The city's population was 100,000 in 1900 and is 3 million today. 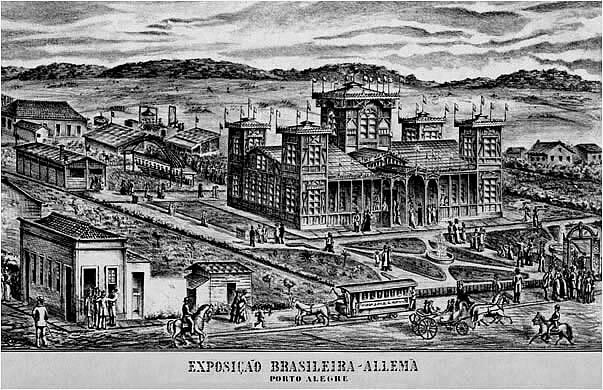 Porto Alegre was always a thriving port and two local businessmen, a Brazilian named Estácio da Cunha Bittencourt and a Frenchman named Emílio Gembembre, opened a horsecar line between the waterfront and Menino Deus on 1 November 1864 [see map]. 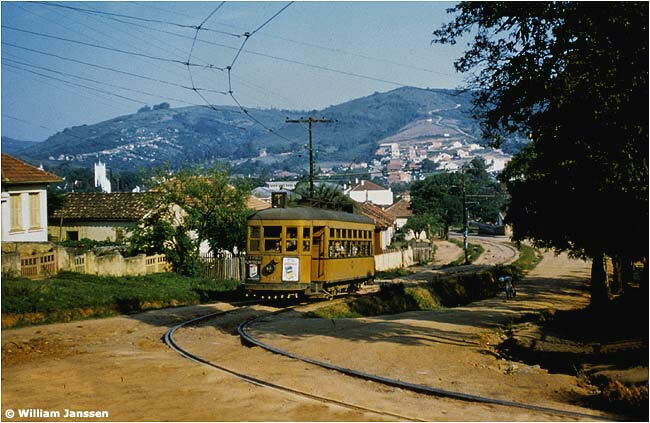 This was the second street railway in Brazil, preceded only by the Tijuca line in Rio de Janeiro, which opened in 1859. The vehicles were said to be double-deckers, but nothing is known of their origin and no pictures of them have been found. Operation ended in early 1872. 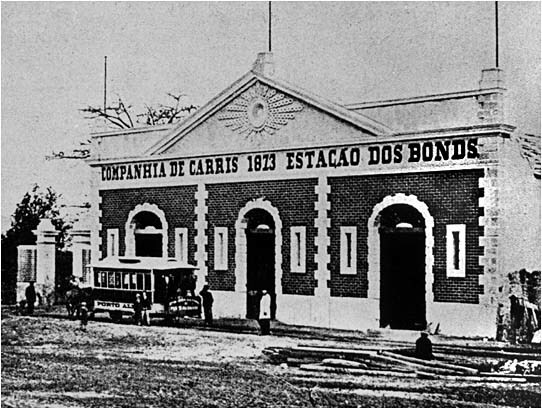 The Brazilian government dissolved CFLPA in 1926 and formed separate companies for transportation and utilities: the new operator of the streetcars was Companhia Carris Porto-Alegrense. 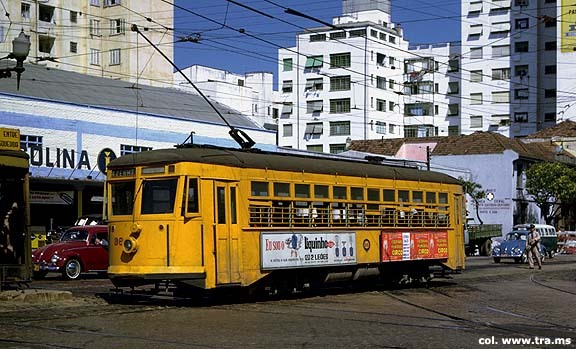 CCPA was acquired two years later by the U.S. conglomerate, Electric Bond & Share, which initiated an import program that would make Porto Alegre a mecca for North American tramway enthusiasts in the 1950s and 1960s. The Americans returned transit operation to the city on 19 February 1954. 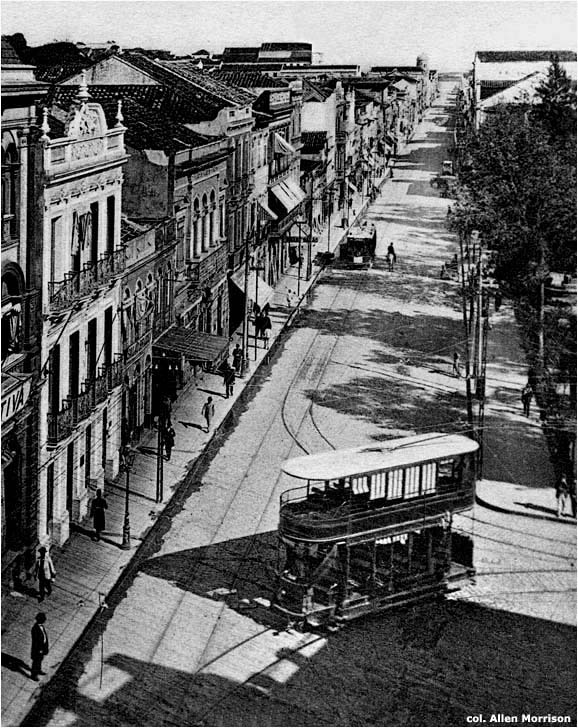 The new Departamento Autônomo de Transportes Coletivos reported that 89 million passengers were carried by 105 trams in 1961. 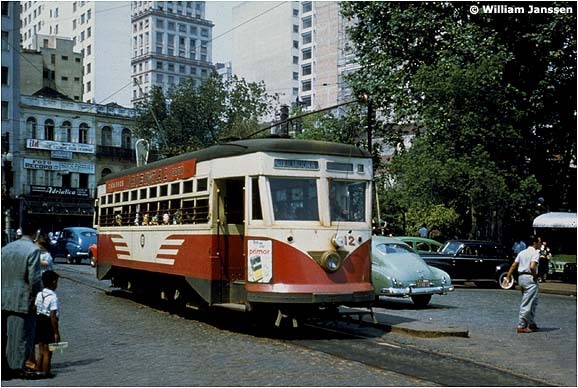 DATC decided to replace the rail cars with buses and inaugurated a trolleybus line on 7 December 1963: five Massari units ran to Gasômetro and Menino Deus – along the streets where mulecars had originated tramway service 102 years before. 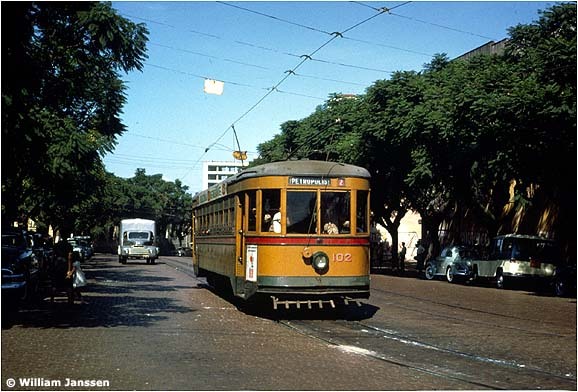 The trolleybus line closed in 1969 and DATC ran the last tram in Porto Alegre on 8 March 1970. 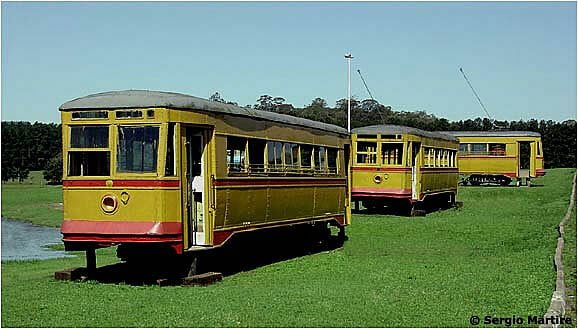 Except for Santos in 1971, this was the last large tram system in Brazil to close. 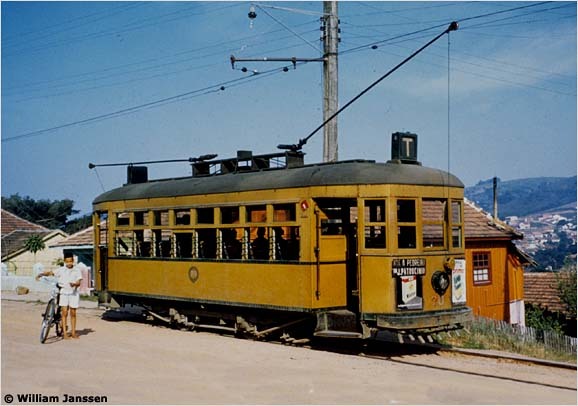 Plans for a heritage tramway have been announced several times since the tramway system closed in 1970, but so far nothing has been built [see BIBLIOGRAPHY, below]. 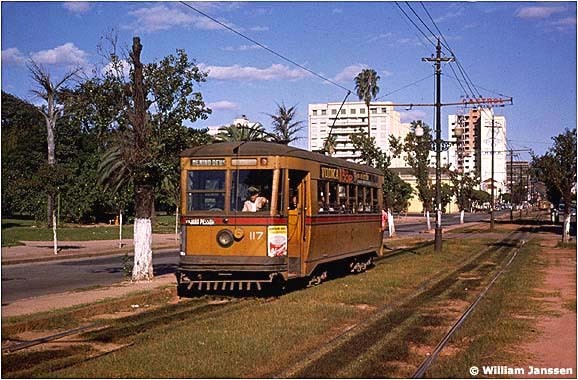 On 11 April 1982 the first 0.6 km of Porto Alegre's Aeromóvel pneumatic railway began carrying passengers along Av. Loureiro da Silva. The first 27 km of an electric suburban railway, operated by Trensurb, opened on 4 March 1985. Gauge is 1600 mm and trains were built by Nippon Sharyo in Japan. Both these lines have been extended and operate today. Untitled news items in Brazil-Ferro-Carril (Rio de Janeiro), 1/4/1918, p. 177; and 20/11/1930, p. 540. 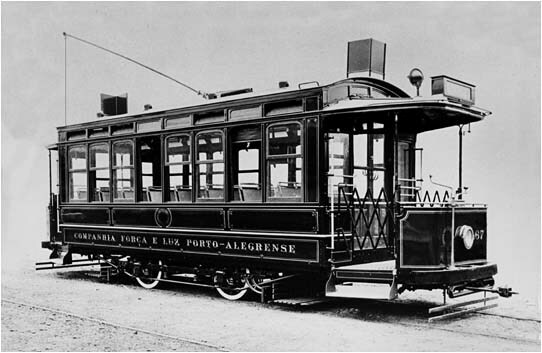 Descriptions of Porto Alegre tramway fleet. 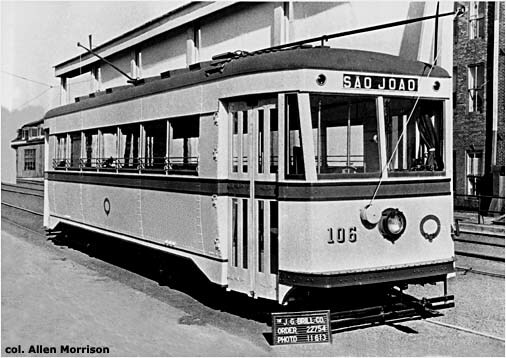 "J. G. Brill Company Ships Cars to South America" in Electric Railway Journal (New York), 5/1929, p. 625. Detailed description of the new Brill trams. Three photos. "A Construção de Bondes em Porto Alegre" in Revista das Estradas de Ferro (Rio de Janeiro), 15/51933, p. 133. Construction of "Miller" cars. Odilo Otten. Planta da Cidade de Porto Alegre. 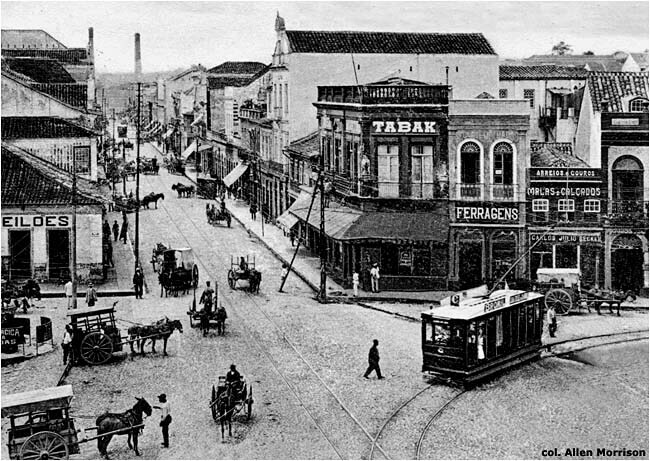 Porto Alegre, 1942. Street map, scale 1:20,500, shows tramway system in nice detail. Archymedes Fortini. Porto Alegre Através dos Tempos. 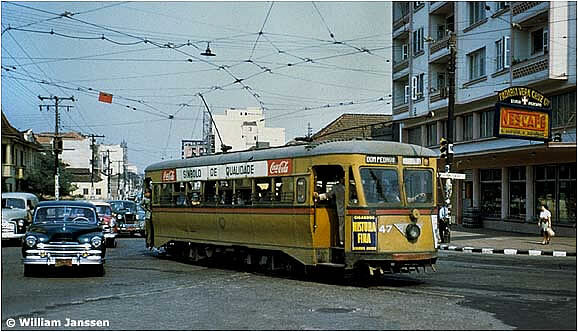 Porto Alegre, 1962. "Da Maxambomba ao Elétrico," pp. 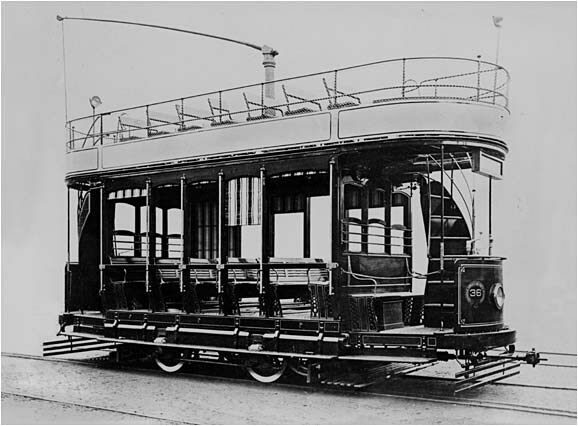 111-12, tells tramway history. Ray DeGroote. Companhia Carris Porto Alegrense, Porto Alegre, Brazil. Unpublished map of the track layout of the tramway system and the Carris yards as of May 1963. Elaborate detail on routings. Walter Spalding. 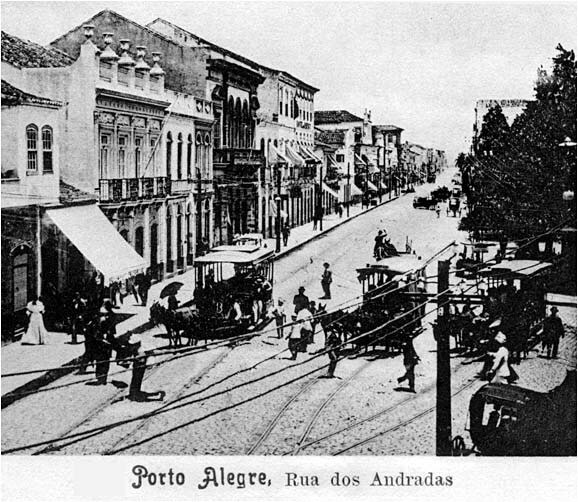 Pequena História de Porto Alegre. Porto Alegre, 1967. "Transportes," pp. 135-8. A. F. S. Pereira. "Os Bondes" in Correio do Povo (Porto Alegre), 17/5/1970, p. 1. Last tram. Asociación Uruguaya Amigos del Riel. 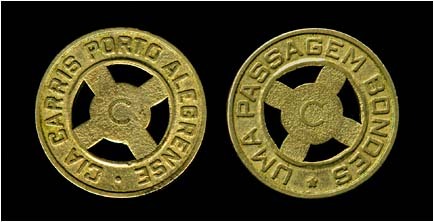 Red Tranviaria de Porto Alegre: Cia Carris Porto Alegrense, 1946. Montevideo, 1977. Large track map produced by tramway enthusiast group. Scale 1:10,000. Size 27 x 45 in / 68 x 114 cm. Alberto André. "Breve História dos Bondes a Burro e Elétricos da Cidade" in Correio do Povo (Porto Alegre), 1980/ 9/21, 33. 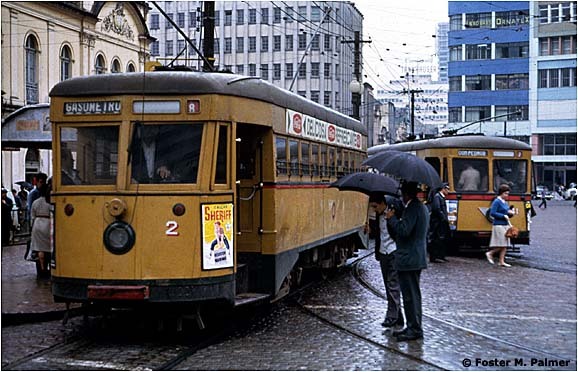 Last, and best, of series of tram articles. Author published other illustrated tramway histories in same newspaper, 25/9/1966 and 18/6/1972. Mauricio Ovadia. Cento e Onze Anos de Transporte: Do Bonde de Mulas ao Transporte Seletivo. Porto Alegre, 1980. 167-page tramway history written by the director of the bus company. Concerned mostly with corporate development, finances, personnel, fares, etc. Tramway route maps, pp. 94-95, show left-hand operation on two-way streets. "Gaúchos voltam a usar bondes no trânsito" in Tribuna da Imprensa (Porto Alegre), 15/7/1988, p. 3. 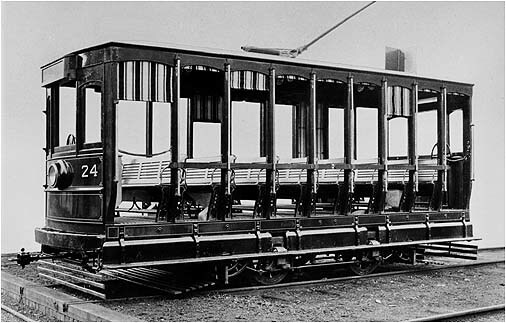 Proposal for tourist line, using Brill car 113. Allen Morrison. 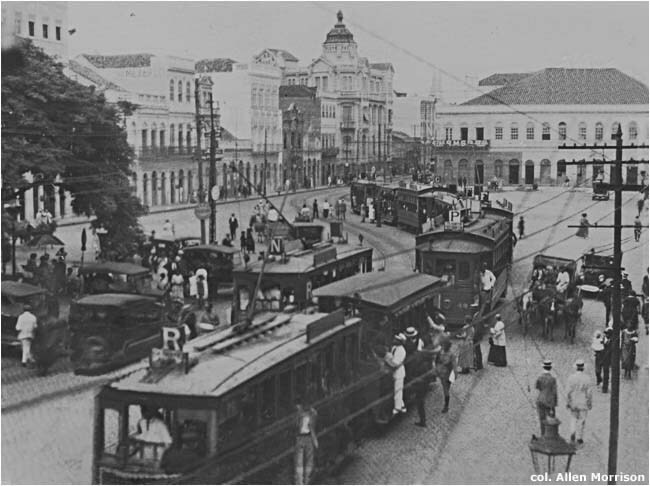 The Tramways of Brazil: a 130-Year Survey. New York, 1989. 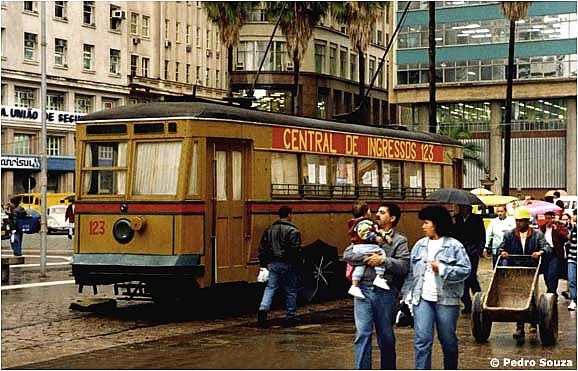 My Rio Grande do Sul chapter (text only) provides additional information about the Porto Alegre tramway system. Companhia Carris Porto-Alegrense. Museu Memória Carris blog. 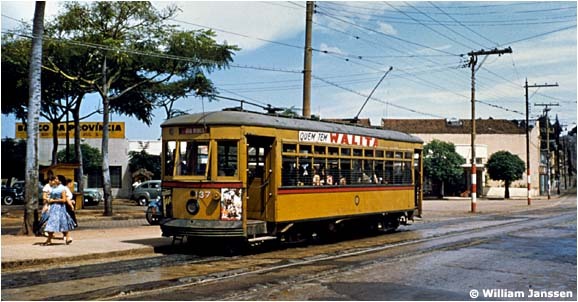 History, descriptions, discussions, photographs of Porto Alegre transport. "Trecho com bonde histórico será implantado no centro de Porto Alegre" in Portoimagem, January 2007. Official announcement of plans for heritage tramway line. please e-mail me! Leio e escrevo português. As fotos coloridas desta página são protegidas pela Lei do Direito Autoral (Lei N° 9.610 de 19 de Fevereiro de 1998) e não podem ser reproduzidas sem a expressa autorização do autor.